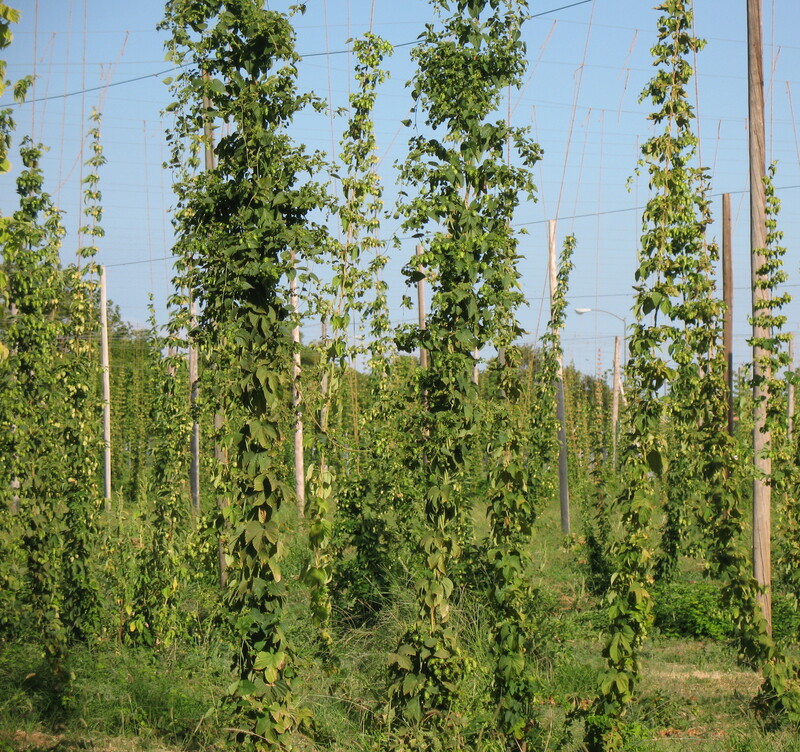 One of the best opportunities to understand fresh “wet” hops, put into a beer without being dried and baled first, is the Wet Hop Festival, this Saturday. The low key annual festival at the Bistro in Hayward, California, is happily near a BART station. Over the years this has been one of our favorite events. It’s easy to get to the Bistro, and the chance to taste small pours of a variety of wet hopped beers all in a row is a rare harvest season treat. The Bistro provides detailed sheets describing all the brews. This year Steve and I are especially thrilled to attend, since our beer — ok, ok — a Sierra Nevada Beer Camp beer that we helped create — will be poured for the first time there! 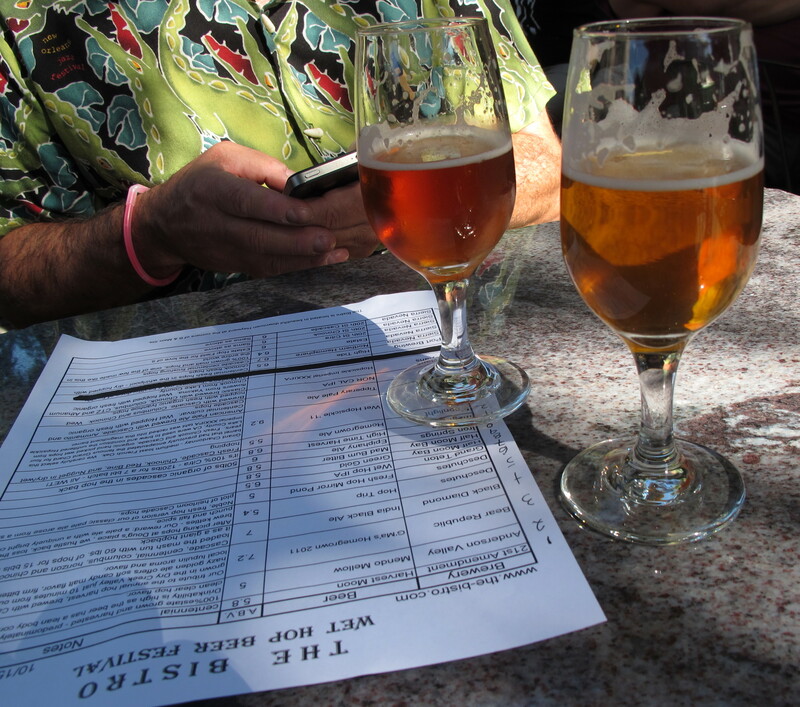 Back in August we participated in Sierra Nevada Beer Camp number 86! The group of campers, none of whom we had met before, emailed some in advance about the amusing significance of “eighty-sixed” as bar lingo. The anticipation was palpable. Terrence Sullivan from Sierra Nevada had told us that there was a good possibility that we could pick some hops from the brewery estate to use in the batch we created. We imagined a light, low gravity, very hoppy ale featuring the fresh hops from the field. 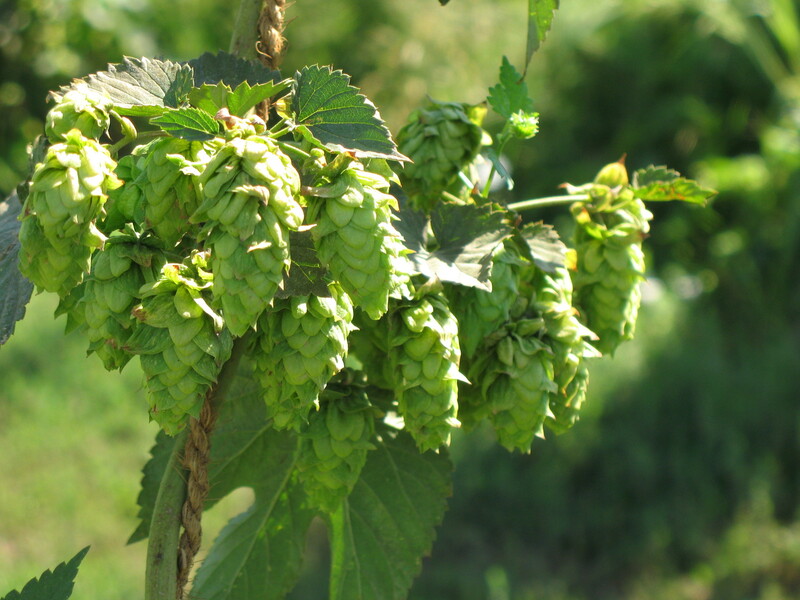 When we arrived and learned that fresh Citra cones, from an arromatic, relatively new and very popular variety of hop plants, were available to pick, we were delighted. You might think that simply having the facilities and talent to create custom one-time small batch beers with guests is an achievement for Sierra. However, that is missing one of the most fascinating parts of the puzzle: Beer Camp relies on creative consensus. So when we met our fellow campers and found out that two of them were determined to make a massive Russian Imperial Stout, we had no idea what the group would do. I kept saying “hoppy session ale” and “fresh Citra hops we can help harvest” but there was no moving our Imperial Russian fan. There was a stunned appreciation. We will be tasting that beer, named “Eighty-sixed,” for the first time Saturday. There will be more fresh hopped beers to compare it with. We’ll be there at the Bistro early, since there is a certain baseball game of interest in the evening, and also because we just can’t wait! More about the visit to Beer Camp in a later post. Right now all we can think about is finally tasting “Eighty-Sixed.” Before it’s, you know, gone.